Product information "bebob B-MOUNT: NEW 24V BATTERY MOUNT BY ARRI AND BEBOB"
Today’s digital cameras are increasingly pushing the performance limits of the established 12 Volt systems. In order to meet the increasing power consumption of modern cameras and lighting with a sustainable solution, bebob developed the B-Mount – a new battery mount system that fulfills the power demands of today’s equipment while providing maximum flexibility at the same time. The B-Mount has been developed in close consultation with ARRI – the leading manufacturer of camera and lighting systems will be using the B-Mount for all its future cameras. Besides, many other equipment manufacturers from different areas have already announced that they will support the new interface in the future. High Power Capability: B-Mount batteries provide a dedicated mobile power supply for high performance 24V devices. Multi-Voltage: The new B-Mount provides 24 Volt high-power but is also equipped to support multi-voltage (both 12 Volt and 24 Volt). Being adaptable for the respective needs of compatible devices, the B-Mount makes it possible to supply all devices on set with a single battery system. Smooth mechanics: With the development of the new mount, special attention was paid to designing a stable, robust construction that features the seamless interlocking of individual components. Open protocol/universal battery communication: While manufacturers previously had to develop various data transmission protocols for different device configurations, only one protocol will be required in future when using the B-Mount interface, which is open to all manufacturers. With the introduction of the B-Mount, ARRI and bebob aim to create a new, universal 24 Volt industry standard for all manufacturers. The specifications for the interface have been made accessible and have already been shared with various manufacturers in recent months. Therefore, the first B-Mount compatible products will already be on display at NAB. 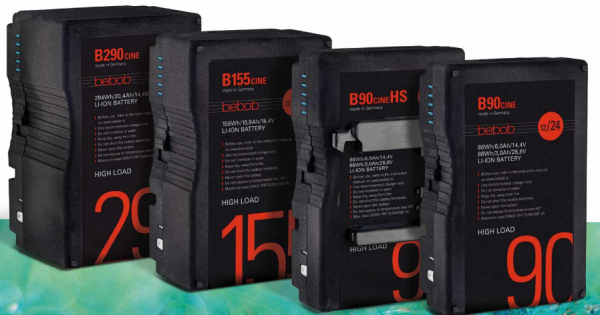 As the developer of the B-Mount, bebob is the first manufacturer to offer a selection of standard batteries with the new battery interface. The first 12/24V capable bebob B-Mount batteries are now available worldwide. Related links to "bebob B-MOUNT: NEW 24V BATTERY MOUNT BY ARRI AND BEBOB"
Customer evaluation for "bebob B-MOUNT: NEW 24V BATTERY MOUNT BY ARRI AND BEBOB"